There's an active thread on Eurobricks discussing the possibility of relaunching a Lego train magazine publication following the demise of the excellent Railbricks. I posted my opinions on this topic to essentially say that whilst I'd love a Railbricks replacement, there probably isn't a commercially viable way to make it happen. It also got me thinking about what I loved about Railbricks and other great model train publications for that matter. The common factor was aspiration. By seeing a showcase of the very best models and layouts, inspired me to push my limits and to have the confidence to do so. Shown above are three publications which inspire me in pursuit of this hobby in very different ways. Iain Rice is no stranger to the UK model train community; having published many books and magazine articles on fine scale modelling. His approachable and witty writing style combined with uncompromising practical advice offered no end of inspiration to my scale modelling efforts. This book focuses on the topic of layout design. Everything from research, planning, operation, visual design, and much more are covered. What really strikes me about this book is how relevant it's content is to any model train scale and standard (including Lego!) 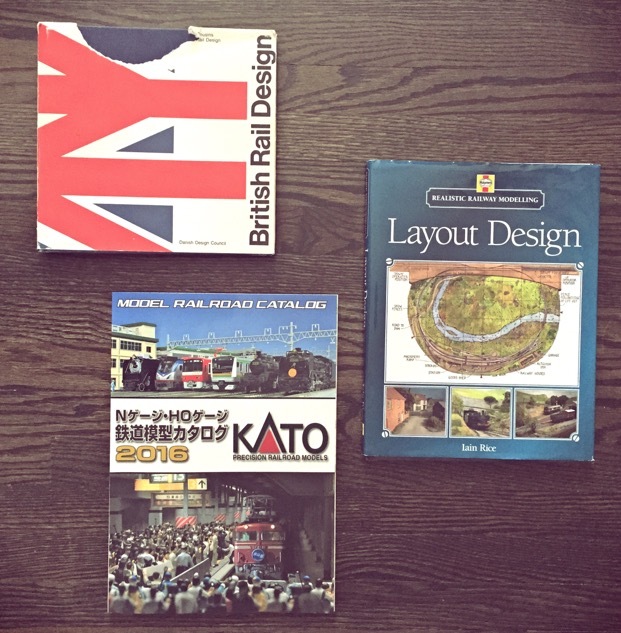 Iain Rice has also published articles on layout design in the US Model Railroader magazine, so his name might be familiar to some US based modellers too. Its not because I have a soft spot for Japanese N-gauge modelling, but I simply love this book! Or should I say catalog? At 258 pages it qualifies as a book! Even though I can't read most of it; I derive no end of inspiration. It shows how mind-bogglingly comprehensive a product line can be made and organized. Kato offers its lucky customers a complete "candy store" of products all designed to work together. Everything from baseboards, track systems, scenery, buildings, infrastructure, control, and yes the trains themselves! They offer a complete range of spares and conversion parts as well as practical how-to guides. It is expertly photographed with superb visual design. It is a fantasy version of what we would all love to have available in our niche Lego train hobby. It evokes the nostalgia of the relatively rich product range of the 12V Train era. And, it inspires me to offer a similar "product" range at L-Gauge.org. A range which is systematic, organized, and accessible to everyone. 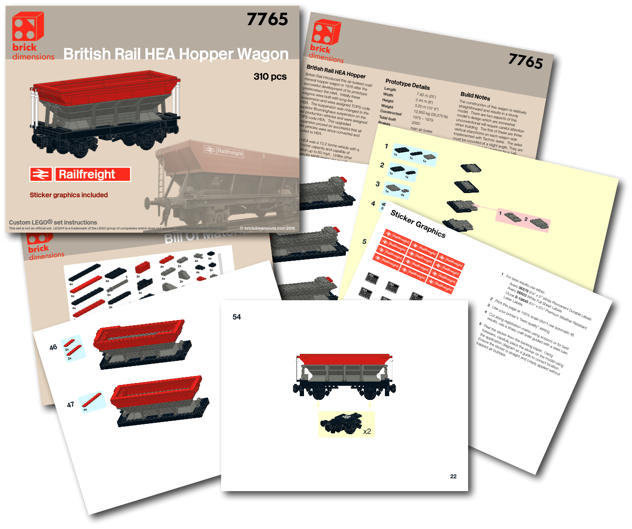 Kit 7765 HEA Hopper Wagon Available! As with all things, some projects finish faster than others. I was intending on completing the instructions for the Polybulk covered hopper; however, this wagon beat it to the store! It has been updated and improved for this kit. 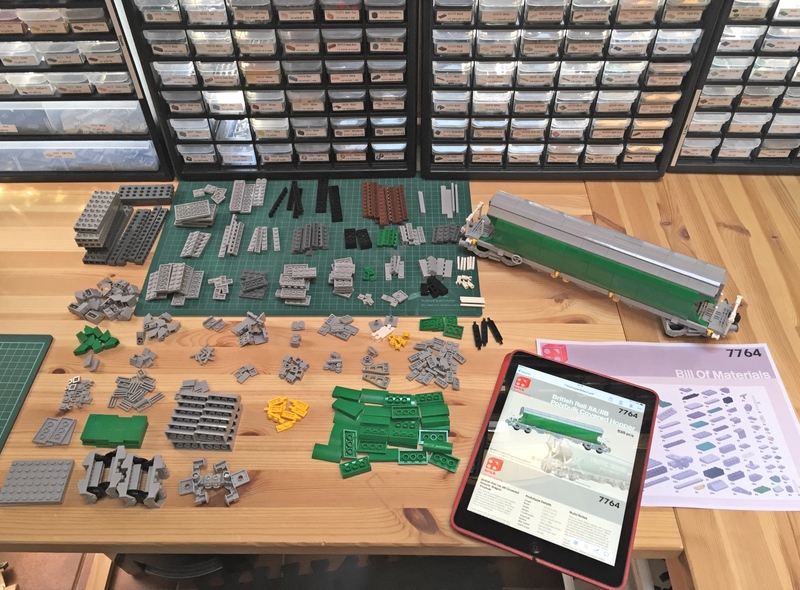 At 310 pieces, it is quite efficient with parts and lends itself to building multiple copies to form a handsome rake of wagons. Available now at the kit store. Its been a while since I've posted. I must confess to being both busy and suffering from "builders block"! I just didn't feel the mojo for building for quite some time. Thankfully, that phase is over! I'm back to building! 2) Hopper body profile is much closer in shape to the prototype. 3) The wagon's scale dimensions are nearly a perfect match to the prototype. 4) More efficient use of parts--only 535 pieces. Shown above is my first "test drive" of the instructions. I kitted out the parts required and took this photo just before building a second copy of the wagon based on the instructions. This is a process I've had to learn to perform more rigorously than my previous kits. Its amazing how many errors, improvements, etc. that you identify when sitting down to build the kit from the perspective of someone else. It has to be more than proofreading the instructions themselves; you actually have to physically build it. You can't identify areas of structural weakness or inconvenient building steps unless you physically handle the model as you build. In any case, I did identify a couple of improvements and have updated the instructions. I just have to prepare sticker graphics and then this new kit should be in the store at www.brickdimensions.com in a few days! Stay tuned!